Size: Plate is an amazing 17.5" X 17.5"
This is a huge plate of fossil seed ferns from the Coal Age deposits near St. Clair, Pennsylvania. It is very hard to get a slab this large from this site, let alone a slab of this size that is this nice! The entire slab is covered with large seed fern fronds and branches - one frond is almost TEN inches long! There are several different types of seed ferns represented on the plate. 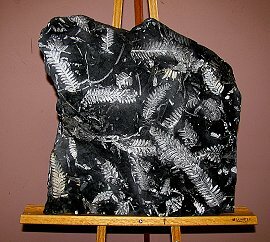 The seed ferns are preserved as a thin film of white pyrophyllite on black shale - quite striking! The fossil plants have excellent color and contrast and exhibit superb detail. And this whole slab (1 1/2 feet tall by 1 1/2 feet wide!) is one piece - it has never been broken or pieced together! This is a huge, top quality display plate of Pennsylvanian plants from a classic location - simply amazing!